Sploop様：Thank you for sending me a good impression about charts! FFCL様：I turned up some keysound's volume for performing, but I also think it is bit noisy to listen. Thanks for your impression and adding GreatMissBGA point! qm s様：You ECed LASTBOSS??? You're Gorilla Ningen!!! I also think the middle part is too easy. I'll improve my pattern-creating skill! KAWAI Bongo Cat and BGA. Fun! Good chart for beginners! Felt connected to the music, and it gave a very balanced and fun challenge! This BMS is really fun! I like the joyous feeling in the music, and the clear inspirations in the style. SPA played. "DONT~REMIND~ME~OF~THAT" I shouted to myself with laughter when I saw the DNA part which definitely brought back my painful memory on twinklesky. Music:450/500 + KeySound:145/150 | BGA:130/150 + GreatMissBGA(5) | Sequence:195/200 ||| BGA is very attentively. The music is rich, but a bit messy, and affects the performance of keysound. ||| 925 ~ Thank you for making. 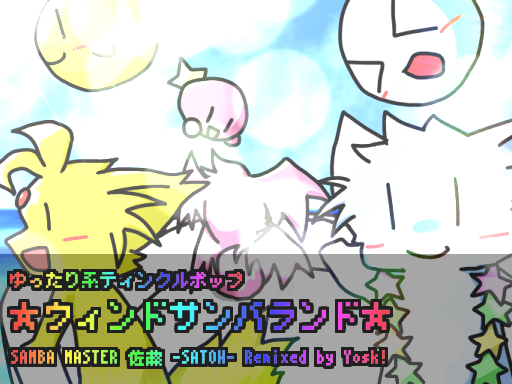 Such a nice remix that as good as previous works in Sambaland series. I ECed the lastboss Sabun and I guess would it be a bit top-heavy? Cause I really feel the intensity drops so fast in the second half except for the last few bars. I think there's no other issues besides this. お疲れ様! Music : 0 Pts. Sequence : 0 Pts. Graphic : 0 Pts. Other : 923 Pts. Music : 460 Pts. Sequence : 430 Pts. Graphic : 0 Pts. Other : 100 Pts. Music : 0 Pts. Sequence : 0 Pts. Graphic : 0 Pts. Other : 948 Pts.